It may seem like a hole in the wall is a couple of trivia. 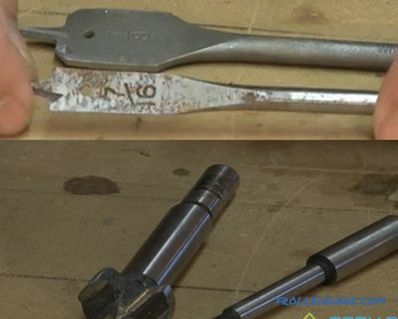 However, if you choose the wrong tool for one or another surface material, the drill bit may become dull or even break, and scratches and cracks may appear on the surface. To avoid this, you need to know the specific nuances of the job. How to drill, how to properly prepare the surface and pick up the drill, consider next. You need to properly hold the tool in your hands. The drill should be located straight and enter the surface in a vertical direction. To make it easier to drill and perform more accurate drilling, you can use an additional handle, which usually comes bundled with a drill. Based on the type of surface you are working with, it is necessary to select the material and size of the drill and determine the mode of operation of the tool. 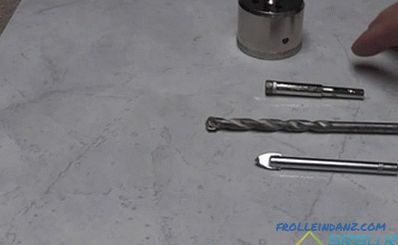 Here is the main principle of how to drill correctly: the material of the cutting tool must be harder than the material of the surface being drilled. Imagine the following situation. Suppose you decide to drill a wall of concrete with a drill designed for wood. You can be sure that nothing good will come of this, and the drill will have to be thrown away. Therefore, the type and material of the drill should be carefully selected for each type of surface. 1. Choice drill. 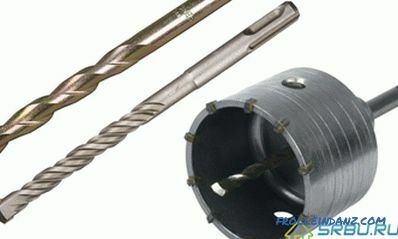 If the surface is brick, stone or concrete, the drill should be taken hard-alloy. Usually pobedit drills are used for such purposes. 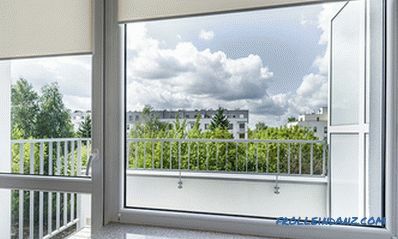 They do not cut the material, and turn it into crumbs, so for concrete or stone walls are suitable as well as possible. But in order to make a hole in plastic, wood or steel, they are not intended. 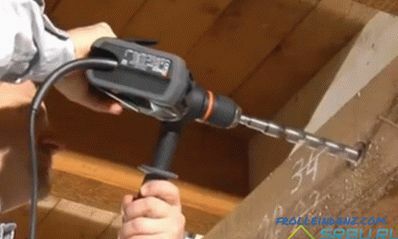 If you try to drill a wooden wall with a drill bit, the wood fibers will break, and the hole will be ugly, sloppy and larger in diameter than necessary. Drilling steel with this drill does not work at all. 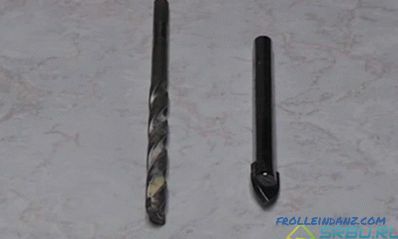 A drill, a drill for a perforator and a crown for concrete. 2. Surface preparation. Before drilling a wall, it is necessary to make sure that there is no electrical wiring, heating and water pipes in this area of ​​the wall. For this purpose it is most convenient to use a metal detector. It reacts both to iron and steel objects, and to objects from non-ferrous metals. With the help of a metal detector, you can find out where the electrical cables are and determine at what depth you can drill. Holes with a diameter of less than 13 mm are drilled, and wider holes with a perforator. However, several large holes can also be drilled with a drill if its chuck is suitable for a conical drill with a diameter of 13 mm. 3. Drilling process. First, you need to outline where the hole will be made. 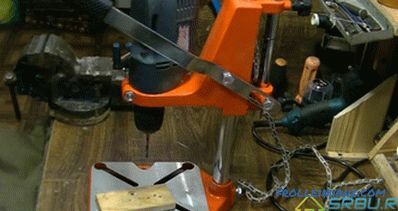 It does not matter if you use a hammer drill or a perforator, in some cases, to start drilling, you need to put the device into a simple drilling mode without impacts and make a recess at low speeds. It is easier to start drilling, the drill will not jump on the surface and you will be able to drill more accurately. And after you have planned the place of the future hole, you can go into shock mode and add momentum. If you are using plastic plugs, the hole must be deeper than the length of the plugs. As a rule, a certain amount of crushed material remains in the hole during the drilling process in the form of dust; it is necessary to leave a margin of 10 mm in length. 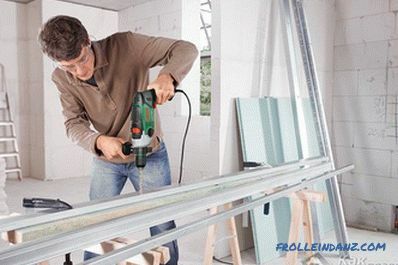 Those who have repeatedly worked with a drill know that it is sometimes difficult to keep it in the required position. The tool itself has considerable weight, in addition to this, vibration occurs and dust flies during operation. To avoid dust on the operator and on the tool itself on the market there are special dust collectors. 1. Choice drill. To make a neat hole in a metal surface, you should purchase a quality metal drill. Cheap drills in this case should not be used, since they not only do not drill the foundation, but also cause a lot of trouble. 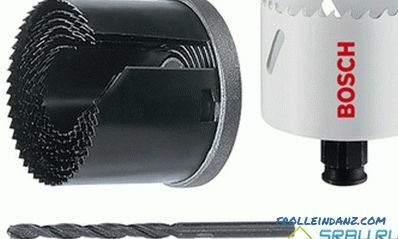 Therefore, try to buy only proven, high-quality drills of famous manufacturers. The normal price for a good drill is about 300 rubles. 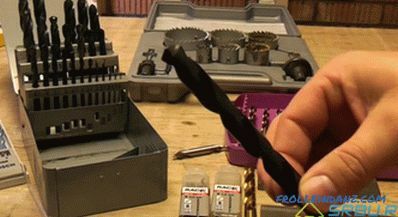 Types of drills and metal crowns. 2. Surface preparation. Before drilling a metal, it is necessary to pivot the middle of the hole so that the drill does not slide off the surface. This work is performed using a center punch, which is a sharpened metal rod. Hammer hit the corer, and its edge knocks a notch in the surface.Thanks to this, the drill can be fixed in one position, and the hole will be correct and neat. 3. The drilling process. To make a hole in a metal whose thickness exceeds 5 mm, it is desirable to use several drills. Initially, the work is carried out with a drill with a small diameter, and then drilled with a large drill to the desired diameter. First, turn on the drill at low speed, then a little increase speed. To drill metal it was easier, it is advisable to lay a board under it. This will make the holes smoother and neat. When metal processing is performed, the drill is heated. It is advisable to lubricate it with a special paste or coolant before work. If you don’t have one, normal engine oil will do. The exception to this rule is gray cast iron, which is always drilled dry. To pull the drill out of the hole, you need to turn the drill in the opposite direction if there is such a function in its mechanism. Often a drilling stand is used for drilling metal, to which the tool is attached. In this case, at the beginning of work on its handle you need to press only lightly, and when the chips go, the pressure should be increased. The drill is installed in the drill stand. There is a direct relationship between the thickness of the drill and the number of revolutions of the tool. Remember that the larger the drill diameter, the lower the revolutions. For example, if you use a drill of 4 mm in diameter, the tool revolutions are about 2400-2800 per minute. If the drill diameter is 6-8 mm, the number of revolutions is significantly less - approximately 1200-1300 per minute. 1. Choice drill. There are special drills for ceramics and glass. It is possible to replace them with a drill for concrete with a hard-facing build-up, if you possess certain work skills. At the same time, the drill for concrete should not be worn much. On the left there is a drill for concrete, on the right for tile. The drills used to drill tiles. 2. Surface preparation. The tile is rather slippery and hard, but at the same time fragile. In that case, if you use a conventional concrete drill for drilling, it is difficult to perform work on the tile, because the drill begins to slip and scratch the base. To avoid problems in the process of work, on the area where the hole will be made, you should stick a piece of plaster. If you use a special drill for tile, then you do not need to do this, the only thing is that if it is blunted it needs to be sharpened. 3. The drilling process. Now consider how to drill tiles. It is impossible to drill the tile itself using a percussion mode so that the icing does not break off. First perform the drilling of tiles. In this case, the pressure should be small. Work is done at low speeds. After the tile is drilled, turn on the impact mode and make a hole in the wall. If a tile was drilled with a special drill for ceramics, then after passing the tile it is replaced with a drill with a pointy tip. 1. Choice drill. 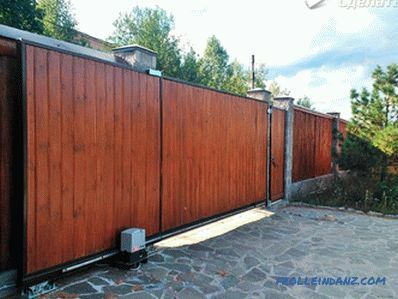 Holes less than 10-12 mm in diameter are usually made with a metal drill. Special wood drills need to be bought only when the hole diameter is large enough, or when high demands are placed on the quality of work. If transverse drilling is performed, a center drill is used, and if a longitudinal drill, then spiral. Above is a spiral, lower twisted drill bit for wood. Higher feather drills, below Forstner drills for wood and chipboard. Various versions of crowns, for drilling large holes in wood. 2. Surface preparation. In the middle of the hole make a groove with the help of awls, so that the drill does not slide off. In order to avoid chipping after the tool exit, a bar is placed on the back of the board. 3. 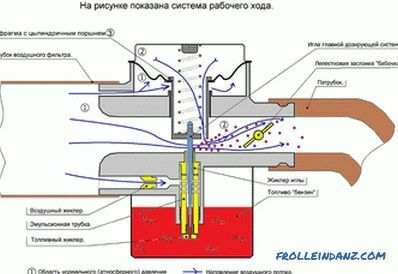 Drilling process. Perform work at low or medium speed. 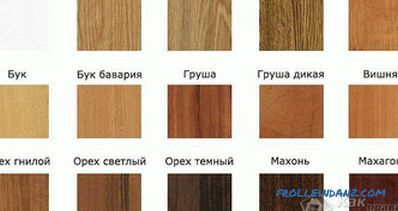 Chipboard has a particularly fragile structure, so in order to avoid delamination of the coating, drills with sharp edges are used, and a bar is placed under the base.